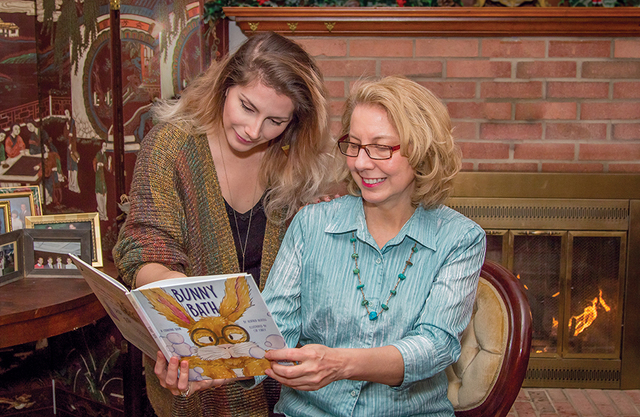 (Jaclynn Zucco Photography) Cat Eskey (left), and her mother, Heather Herzog, with their book, "Bunny Bath." The mother-daughter duo of Heather Herzog and Cat Eskey set out on a creative journey long before thinking a top-selling children’s book was in their future. Bunny Bath, A Counting Book, written by State College resident Herzog and illustrated by Eskey, a State High and Penn State grad who now lives in Colorado, recently became a bestselling eBook on Amazon. Bunny Bath is about seven little bunnies that get ready for bed by chaotically counting one by one as each gets into the bathtub. Among the thousands of books, Bunny Bath reached No. 11 this past November on Amazon’s Best Sellers in Children’s eBooks list. In December, the book was named “No. 1 New Counting Release for Toddlers and Babies” by Amazon. This put both the hardcover and eBook in the top 10 percent rank out of millions of titles. After Cat was born, Herzog says she wrote between 15 and 17 manuscripts of children’s books as a hobby that she loved and treasured. The idea of Bunny Bath began years ago when Herzog, her husband, and daughter lived in Southern California. At their San Diego home, Herzog had a garden of vegetables that she noticed were being eaten by rabbits. During this time, she began writing a counting book and shared it with her daughter before bedtime. Living in California was the most creative time in her life, Herzog says. “It wasn’t anything more than me trying to capture the magical mystery of childhood while watching my daughter grow up,” she says. When Cat was 4 years old, Herzog received an offer from Penn State to work in public relations. The family relocated to State College. Later, after health issues started to develop, Herzog took time off from her 18-year career in communications. Her time off would bring a new project to take on. “I felt this was the universe telling me to step back and look at what my original dreams were,” Herzog says. It was time for her to focus on healthier energy, rather than constant deadlines. Searching for a sense of joy, Herzog remembered the manuscripts she had written and decided to send Bunny Bath to a local publisher. Penny Eifrig, editor-in-chief of Eifrig Publishing, was immediately interested. Eifrig decided to publish Bunny Bath, but advised Herzog that they needed an illustrator. “Penny has worked with a lot of incredible illustrators, so when she picked my daughter, Cat, we were very honored,” Herzog says. Ever since Eskey was a little girl listening to her mother read Bunny Bath, images had appeared in her mind. “I can remember my mom reading me her manuscript of Bunny Bath when I was a child and the visions I imagined for each of the seven rabbits scrubbing away and playing,” says Eskey. Eskey earned a bachelor’s degree in communication sciences and disorders at Penn State two years ago. She lives in Boulder, Colorado, where she teaches yoga, hikes, and enjoys the outdoors. Where does the name Bunny Bath come from? According to Herzog, it all fell into place – from the title to the rhymes – during those evenings in the garden with her daughter. The idea of it being a counting book was ironic for Herzog, because she was never a numbers person. “If you make numbers fun and easy maybe children will carry it with them for the rest of their life,” Herzog says. Bunny Bath has made an impact in the community, too. Last spring, Herzog donated 200 books to children born at Mount Nittany Medical Center, an idea her husband, Steve Eskey, came up with. Herzog is touched that new mothers from the community recognize her and share how Bunny Bath is the first book their child has ever received, which holds a special place in their heart. Various local speech pathologists have used her book during sessions because the rhyming and repetition helps children with pronunciation, she says. What has Herzog learned from this success? After all of the excitement surrounding Bunny Bath, Eskey told her mother she wants to collaborate again. Among all of Herzog’s manuscripts, Eskey narrowed down her choices and picked a very special one. Readers should keep an eye out for The Sunflower, which is their second project. This is neither a rhyming book nor a children’s book; rather it is one with many levels of meaning aimed to speak to people of all ages. Herzog describes it as having an environmental and spiritual message. “There are gorgeous looking illustrations with more of a fine arts approach,” says Herzog, who thinks it is interesting how the writing and illustrations differ from Bunny Bath. To learn more about Herzog and Eskey, go to their author/illustrator website, www.bunnybathbook.com, where there will also be additional information on the upcoming book, The Sunflower. To learn more about Eifrig Publishing, visit www.eifrigpublishing.com.